Hi and welcome to the Counterfeit Kit Challenge Members Blog Hop. Each month we have so many talented and inspiring scrappers joining in on the counterfeiting fun that it's great to have a place to showcase them. Sit back, relax and enjoy this blog-gallery tour including Master Forgers and the amazing CKC participants. While I didn't create a mini book, I translated those tags into a 12x12 layout. It's fun to a have many little canvases to create vignettes. This little shop in the shore community of Ocean City, New Jersey is a favorite of mine. The owner carries a unique mix of antiques, shabby chic furniture and well-chosen new items that fit that beachy feel. I like to say it's "Country Living" meets "Coastal Living". In each one of my "vignettes" I tried to include embellies that evoke the feel of the shop: pom-pom fringe, well-worn denim, lace doilies, a wood veneer ship in a bottle and of course, gingham, for the Gingham Whale! Thank you, Dawn for your creativity and inspiration! Remember, if you are ever stuck in a rut or don't feel you've got your scrappy mojo, be SHORE (hehehe!) to check out the blogs of your Master Forgers and the faithful followers of the Counterfeit Kit Challenge. Now go hop along and be inspired! Your next stop is Milissa. Lynette http://sassyscrapper2010.blogspot.com YOU ARE HERE! Milissa http://millermall.blogspot.com GO HERE NEXT! Hi there. Thanks for stopping by to see how I made my knock-off Thickers. You know, the ones in the July Kit that are black with white pen scribbles? I just so happened to have the original in my stash, but you can be sure the day is going to come when I'm missing an "e" or a "t" and this technique just might save the day. I simply found some raw chipboard letters I've had forever and painted them black. You could even paint over some chipboard letters you aren't so fond of anymore. How's THAT for stash busting! Then I used my white gel pen to add the scribbles. And there you have it. Hello...my little lovelies! Exact? No, but close enough for me. They have the same look and feel and it only took a few minutes to put these together. Be sure to keep your eyes and mind open to counterfeiting opportunities out there. It's so much fun to pull it off! Challenge #1 for the Counterfeit Kit Challenge is to draw inspiration from one of our Master Forgers. 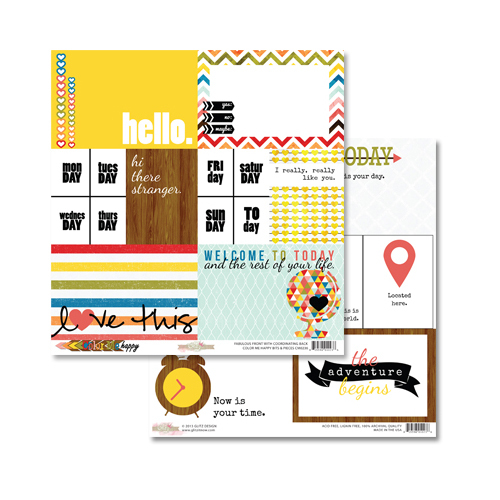 I am always in awe as I peruse the works of my partners in crime and see their varied talents, but I decided to choose one of our newest Master Forgers who also happens to be my scrapbestie. I "met" Leslie S. (LCSmithSAVED) online in October 2010 during Lain Ehmann's Layout A Day Challenge and over the years we have developed a special friendship. She has helped me grow as a scrapper and has taught me some valuable scrappy lessons that I have applied to my own layouts. 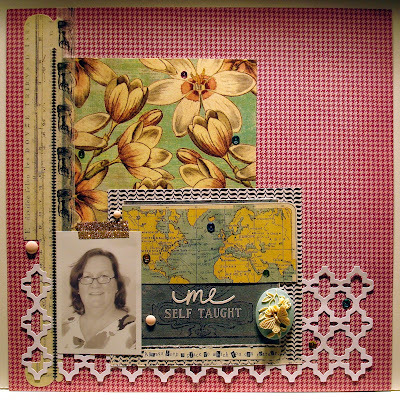 Leslie's CKC "audition challenge" was to create a self portrait layout. Scrappy Things I've Learned from Leslie. Leslie's #1 Motto: Make the patterned paper work for you! You can see that I implemented all of her techniques! Chevron stamped in black...check. Sun outlined in black pen...check. Tropical flowers fussy cut...check. Upper thread is orange. Lower bobbin thread is red, but you would never know it! Leslie has such a great style and eye for pattern. We are so lucky to have her on our team. Check out her blog...you are sure to be inspired!